Birders: Look for this logo when you're visiting this area! 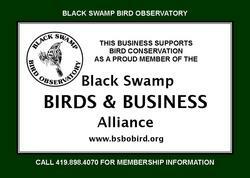 Our Black Swamp Birds & Business Alliance is a program designed to promote local businesses to visiting birders, and to create a network though which we can communicate conservation issues to our local business partners. See a list of participating businesses, below! An occasional e-newsletter to alert you to conservation issues in the region and suggest ways your business can become involved. For questions contact us at (419) 898-4070.